Whatever the challenge at your organization—improving customer service, coping with change, inspiring transformation, improving corporate culture, recruiting and retaining great talent, building teamwork, fostering innovation—it all comes down to this: someone has to do something significant and enlist others to help. Someone, in other words, has to lead. And it doesn’t have to be the boss. Leadership, ultimately, has nothing to do with the title on your business card or your position on the organizational chart. It’s about who you are and what you do to change things for the better—regardless of your “place” in the company. 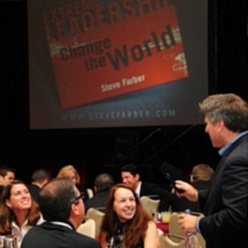 Steve Farber's Extreme Leadership framework is a new and vital paradigm for our exciting--and challenging--times. Expand Yourself – you’ll discover tools to deepen and expand your personal capabilities—the raw material for true leadership. Give Yourself – you’ll learn the art of ‘philanthropizing’ your leadership approach—the raw material for developing capacity in others. 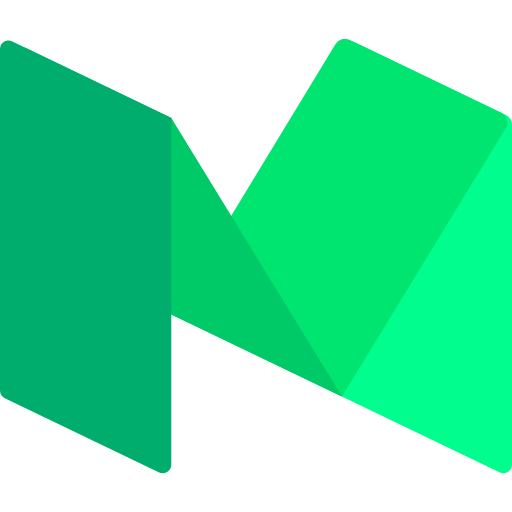 influence—the raw material for changing your organization for the better. Whatever the challenge at your company—improving customer service, coping with change, inspiring transformation, improving corporate culture, recruiting and retaining great talent, building teamwork, fostering innovation—it all comes down to this: someone has to do something significant and enlist others to help. Someone, in other words, has to take accountability. Someone has to lead. And it doesn’t have to be the boss. Leadership, ultimately, has nothing to do with the title on your business card or your position on the organizational chart. It’s about who you are and what you do to change things for the better—regardless of your “place” in the company. 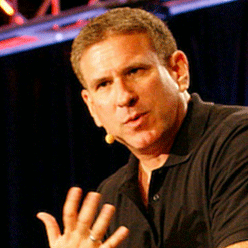 In Radical Accountability, leadership speaker, Steve Farber, will show you four personal strategies for being the architect of transformation from any position or level in the company. Here’s the idea: Steve’s been in the trenches. 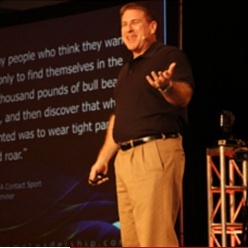 He has over 20 years of experience working with thousands of business leaders in all kinds of industries. And much of that experience has revolved around having open, honest and powerful conversations about the nature of leadership with his clients and then helping them to apply new ideas to their specific challenges. To put it simply: there is no script when you’re dealing with your client’s current business realities. Now, the fact is that Steve delivers a powerful and entertaining keynote speech. And he loves to do it. But the Extreme Leadership Jam Session is a departure from the leadership speaker norm, because there is no script. With the exception of a couple of principles to set the stage, there is no specific list of points to be covered. The audience will determine the course of the program. Right on the spot. And the program will develop according to the group’s most pressing leadership needs and questions. THIS WOULD SCARE THE PANTS OFF OF MANY “PROFESSIONAL SPEAKERS.” Take away their script, and you take away their net. And many speakers either don’t like that, or, frankly, have nothing to say beyond the scripted word. Farber loves it, and so will you…if you have the nerve to give it a try. Farber sets the stage and proposes a few challenging ideas to the group. He briefly defines Extreme Leadership and talks about the importance of open dialogue. 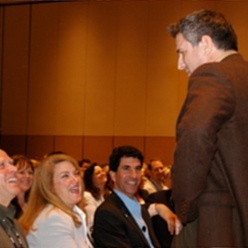 The audience — which could be as small as 10 people or as large as several thousand — forms into small groups or clusters, has a quick discussion according to Farber’s guidelines and then generates One Important Question about leadership as it relates to their current work/life situation. Farber fields the questions (as many as possible giving the amount of available time and the size of the group), and, when appropriate, facilitates a discussion with the entire audience. And away we go! Learning about the Extreme Leadership principles that people need right now. 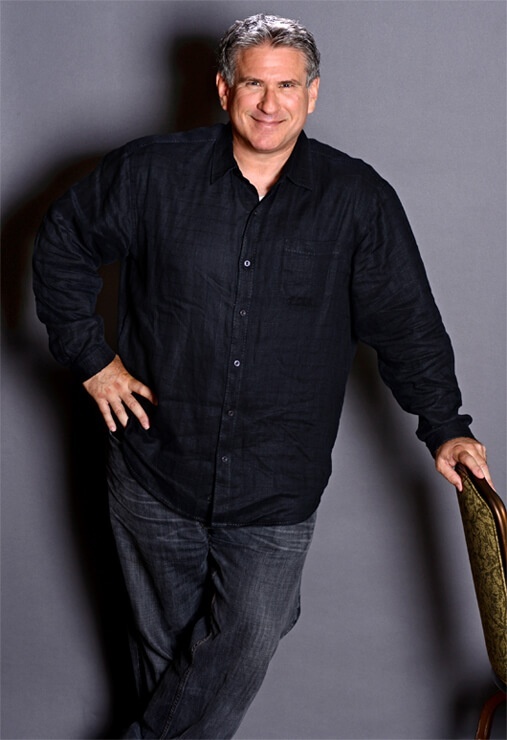 Former Vice President of the Tom Peters Company, Steve is the President of Extreme Leadership, Inc, and the founder of The Extreme Leadership Institute, organizations devoted to the cultivation and development of Extreme Leaders around the world. His accessible, deeply inspirational, and eminently practical Radical LEAP framework is widely used across the business, non-profit and education spectrum. Farber has been credited with redefining leadership in deeply personal yet practical terms and re-energizing thousands of people to make a significant difference in their businesses, lives, and the world around them. Steve has worked with Johns Hopkins, Cisco, Intel, TriNet, Hyatt and hundreds of other organizations large and small. He has spoken to or worked with virtually every industry there is--from the tech sector to financial services, manufacturing, health care, hospitality, entertainment, public education, retail, and government.